Like the Mr. Giant of wallet world, especially when talking about men’s wallets, 90 percent bifold wallets will be reminded firstly. Nowadays, bifold wallets not only play its basic role of carrying our everyday essentials like they were in the past, but also have an influence on displaying to the world our personal taste of style and fashion. Might a small wallet can’t take a huge part in style choice to define who we are, but it does help us to stand out from the herb efficiently. If you intend to choose a bifold wallet for casual use, it’s even more important to bear on mind some elements to consider. It’s not just something look good on you or a powerful carrier of your essentials, but also a wallet with high durability that can stand wear and tear. 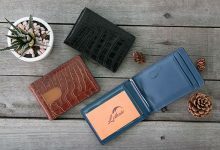 From that point, here are our best bifold wallets for men that have taken a lot of time for searching, comparing and analyzing from us. Take a look at this wallet and tell me what kind of material it is made out of? Alligator? Nope! It’s 100% genuine cowhide leather. Surprised!!! 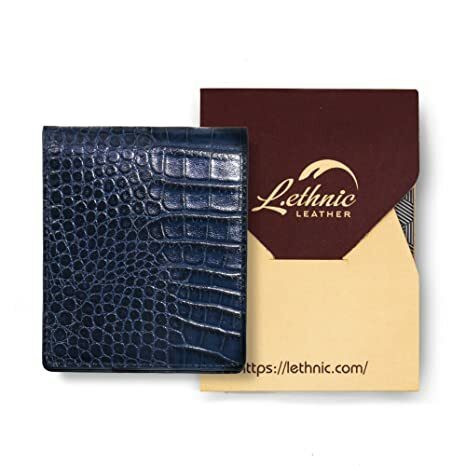 Long gone are the day that I first saw this wallet, I was like “OMG, it must cost a fortune for that amazing luxe”, but after a while searching, I found out that it was cowhide leather with nicely crocodile embossing. I bet you feel the same way as me, right? It looks like real alligator skin! Particularly, the leather texture is freakily smooth and durable. However, this wallet isn’t just getting by on its look alone, its interior is absolutely no joke. Though the construction might be a little bit different depending on the type of wallet you go for, its inner organization is extremely neat with 6 card slots, some functional pockets and 1 bill compartment. If you are a currency collector, double full-length bill compartments seem to be a better idea. Let’s go for the horizontal design. 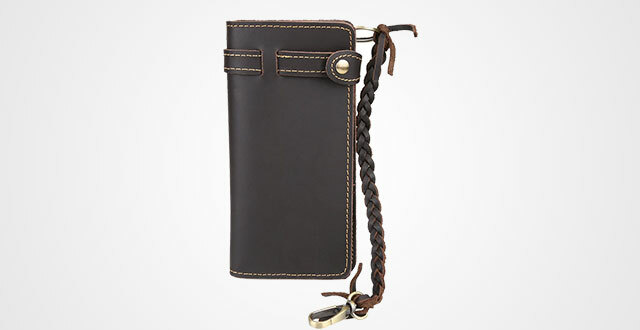 On the contrary, if you need more functional slots that can accommodate a variety of stuff, a vertical wallet is great. 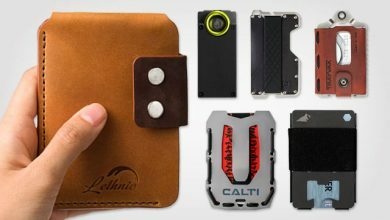 And like any other Lethnic’s wallet, this product line comes in an advanced built-in RFID Blocking Technology, which I really appreciate because you know it, the risk of identity thieves is getting more and more which is synonymous to the more dangerous of losing your property. That’s why choosing for the best RFID wallet isn’t a nonsense thing in this modern time. While bifold is the Mr. Giant in wallet world, Coach is like the king in men’s wallet. They always earn trust of their customers by offering really qualitied products with catchy and sophisticated design. In Coach wallets, there are two things: practical and luxury. 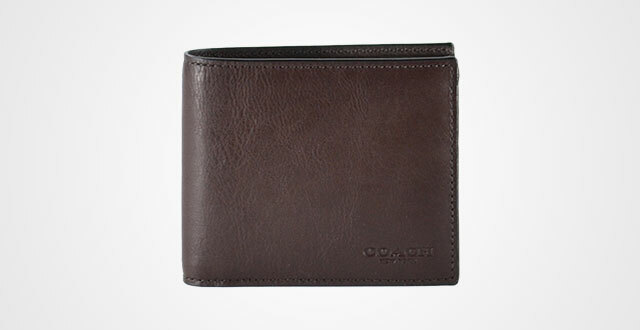 Like this Coach Bifold mens bifold leather wallet, it is made from the finest leather on the market – sport calf leather – with distinct luxury and softness. This kind of leather might ask you a bit time to take care every month but trust us, if you do know to maintain the texture, it will last you decades. Apart from their expensive material, Coach bifold wallet is also attractive by its rare color shade – a deep brown called Mahogany. It’s quire dark, creating a masculine, calm and gentle feeling. A great combination between leather texture and color to display personal characteristics of user, very subtle. Do you wonder about its construction? 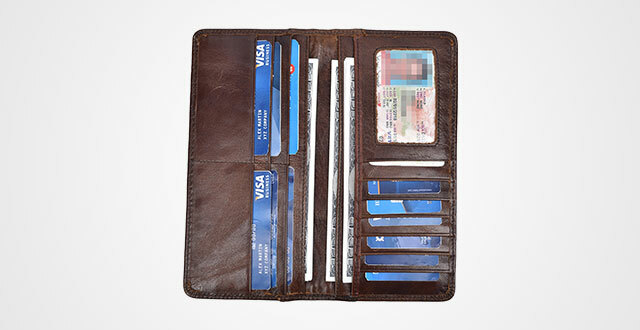 This wallet consists of 8 card slots, 2 additional slip pockets and 1 bifold pocket. Moreover, there is a detachable passcase with an ID window for your identity card. Its design is clear so that you can get it scanned conveniently without getting out. Back to its outer performance, the wallet has tendency of simplicity with full plain design, except for a nicely logo embossed on the front. Talking about its dimensions: 4.25″ (L) x 3.75″ (H) x 0.5″ (D), very concise and intuitive, which is suitable for putting in your back or front pocket with minimum bulk. If you are looking for a more versatile bifold wallet that can be your best companion in many occasions such as business appointment, travelling, daily use and hanging out, I highly recommend this long design. Aside from extra storage space, your EDCs will be organized better because there are up to 18 card slots, 1 zippered pocket and particularly, 6 spacious full-length compartments. This is super convenient if you travel abroad because you need to carry along more cards, cash and documents. Thanks to various long compartment, you can take advantage of 2 or 3 for different paper currencies, and the rest for boarding pass, passport, smartphone, receipts and so on. I also appreciate the zippered pocket because some foreign countries will ask for coins. This storage space will take that job of keep these little things secure and safe. Or, you can place some keys or important documents that needs high protection. Don’t worry about the identity thieves as well because this wallet is equipped with RFID Blocking Technology. Take note that it can prevent 13.56 MHz Frequency. In generally, if you are a guy who love carrying the whole world along, this is the best bet to go to. By the way, its Saffiano leather texture is really on point, I wish you could see and touch it. 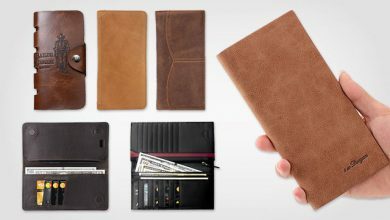 This kind of material makes the wallet itself look more luxurious to many times, which is even perfect for businessmen. Importantly, they also provide a 30-day money-back warranty to cover any mistakes from manufacturing process. You should try it! Coach bifold wallet catches your eyes with its luxury look whereas this Fossil design is addictive by its unique and style. Something really old vintage and rusty but still remain a masculine and powerful. It is the best choice for bikers who want to show up their distinct and strong personality. This bifold wallet is invested by using 100 percent leather and leather lining with pebbled finish to ensure delivering the highest quality and durability to customers. Particularly, it enables to be washed, by hand only. Come in 3.5” high and 4.5” wide, the wallet is slim and trim enough to stay comfortably in your back pocket without ruining the trouser line. Impressively, it can accommodate many stuffs like 12+ cards, documents and lots of money depending on particular needs. It’s a big thank you to the clever compartment and arrangement of this wallet. 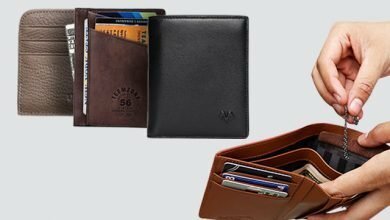 Apart from 8 card slots, 2 functional compartments splitting into both inner side, there is one full-length compartment on the top for straight cash and one side pocket with smart strap for quick access. 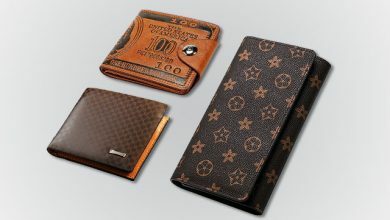 Particularly, it contains a separate mini wallet with 3 more card slots. In a word, this stylish wallet is the best choice for those who have habit of using cards for their payment. 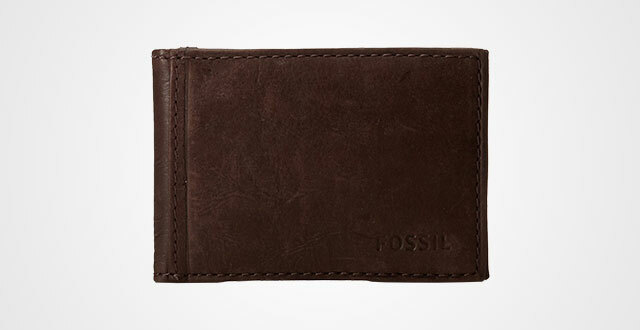 Another Fossil bifold wallet with money clip made from 100 percent real leather with the ability to be hand-washed. However, its construction is a whole different. Going outside in, on the back, there is a clear ID window that helps to expose needed information of your identity card for quick scan. On the front, there is a horizontal pocket with large space to store up to 2-3 cards at the same time. Meanwhile, its logo is nicely embossed on the corner. On the interior, there are 4-5 card slots, 1 magnet clip and a long top compartment. Based on such arrangement, its maximum capacity will be 10+ cards, more cash by comparison to the previous Fossil and documents with higher organization. The magnet slip is well-made and strong enough to keep folded cash in place without falling out, awesome. Talking the durability, Fossil is famous for its superb durability. There are many customers giving compliments for its long, long lasting. By acknowledging some caring instructions for leather, you can make your piece serve for years. A bifold money clip wallet from Serman. Though this brand isn’t as big as Fossil or Coach, it does have a rather high position in men’s wallet world. There are countless compliments from customers about their stylish design and beautiful leather texture. In addition, they also offer 12-month warranty covering any detects derived from manufacturing process so that you can feel free in mind to give it a try. More detail about this wallet, it is measured 4″ in. x 3″ in. .4″ in. and made from the Finest Full Grain genuine leather which is a premium and high-quality material. This kind of leather is famous for its unique softness and beautiful texture. In addition, it is the high durability that surely last for years. Moving onto the construction, this bifold has 1 outer card slot with a pull tab for quick access, 2 more card slots on the interior, 1 clear ID window and 1 stainless steel money clip. 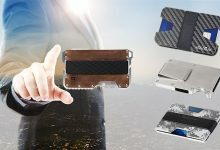 It can maximumly fit with 6-8 cards at the same time while the clip is also strong and powerful enough to keep roughly 15 bills. The biggest benefits of using a clip instead of the traditional compartment are its clear view, quick getting out and in as well as better capacity. 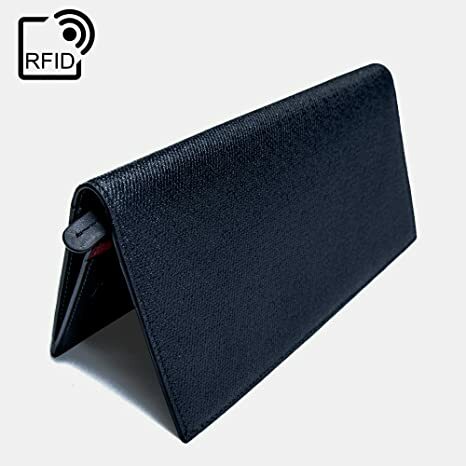 On the other hand, this is one of the best bifold wallets for men that is equipped with RFID Shield to prevent your private information disclosure. This technology is tested for 13.56 MHz Frequency to make sure your bank cards, ID card and driver license be safe. Refresh with this minimalist bifold wallet from Humei – a wallet brand which is well-known for its subtle handcraft, striking aesthetics and high practicality. 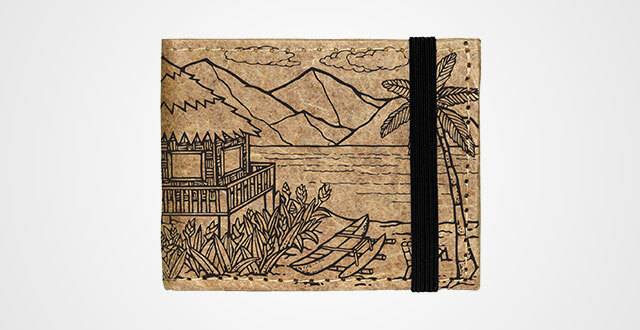 At the very first glance, you might wonder if it a canvas wallet. 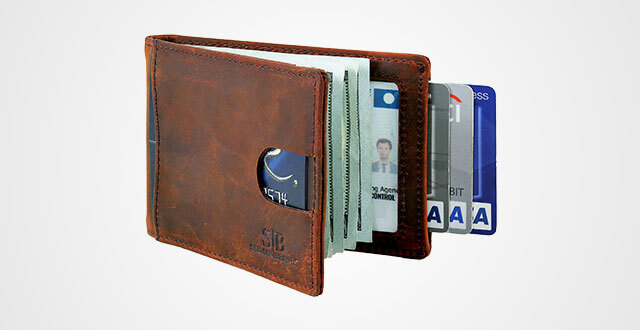 But the answer is no, the whole wallet is made completely from genuine leather, very soft and comfortable to touch. Due to its design – squared, nicely contrast lining, simple concept with logo embossing in the corner – this is an ideal choice for a casual wear to hold your every essential. One thing you should bear on mind is that this is a minimalist wallet so that just go ahead if you are also a minimalist person who love carrying less. In more depth in talking, it meets the most basic requirement of a minimalist wallet – slim and compact. Slim from its design to its silhouette that easily puts in any pocket. Compact from its amazing measurements: 3.8 x 4.6 x 0.6 inches. However, the wallet doesn’t miss its function – carrying. The evidence is that it can hold up to 8+ cards, 1 ID card and 10-13 bills. Stylish, slim, practical and catchy, there is no reason to deny such best bifold wallet. Travelambo is a trending brand in the recent pass because of its amazing cheap price tag yet good quality products. Moreover, it’s unique and catchy, like this bifold wallet, we can clearly see that its distinction is from the carbon fiber layered on the outside, underneath is genuine leather. 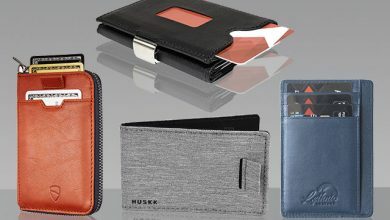 Not just deliver a unique and more attractive look, as the material is high quality, the durability of this mens bifold wallet is also enhanced a lot. 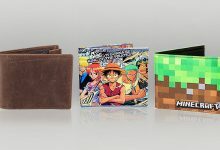 By this advance, the wallet not only looks unique and more attractive, but its durability is also enhanced a lot. In combination to leather lining and luxury logo printed in the corner, the wallet displays a really powerful, tough and manly look. On the other hand, this bifold highlights its RFID Blocking Technology, which has already been tested and approved by a third party for the ability to prevent 13.56 MHz Frequency. To that end, just feel free to bring your valuables and essentials like credit cards, driver license, ID card along with no fear that data thieves would hack them. Catchy design, great security and now is the spacious capacity. The whole construction includes 8 card slots, 2 flip-up ID windows, 2 functional pockets and 2 large cash compartments, not only gives huge space for storage, but also better organization. To be honest, at first, I really doubt at this mens slim bifold wallet after knowing that it’s made out of vegan banana fiber paper. What, paper? So, how can it bear such a lot of stuff? Will it be safe and protective? But again, it’s interesting enough to urge me to try and yeah, it’s better than what I thought. Firstly, I was attracted by its one of a kind outlook, from the packaging to the wallet, they are all unique and beautiful. As you can see, the packaging is also made from banana fiber paper. It is closure by a zipper and the seams are strong enough to deliver a great protection. Inside is the wallet. It has beautiful art on the outside. In terms of construction, the wallet includes 6 card slots, 2 hidden pockets, and 1 full-length compartment. In general, it has moderate capacity to fit up our everyday carry. Another interesting feature is the elastic band on the outside. It’s used to keep our wallet shut when not in need, which I’ve never seen in any bifold wallets before. For those who wondering about its durability, I confirm that it’s very good. After searching, I found that this kind of fiber is as sturdy and strong as a rope so that it can bear heavy load. Not saying that, this kind of material helps to cut off the weigh, or slim down the wallet’s profile to manage its slim silhouette. There’s just one thing you should take notice when caring for this piece is to remember to reapply a natural wax layer for retain its water resistance ability. I think that many of you were hooked into this bi-fold wallet because of its “100-Year Warranty”, right? Actually, Hanks is a mid-tier brand specialized in genuine leather accessories such as wallets and belts. They are famous for very quality products with character and unique design to make a speak for anyone’s taste and personalities. 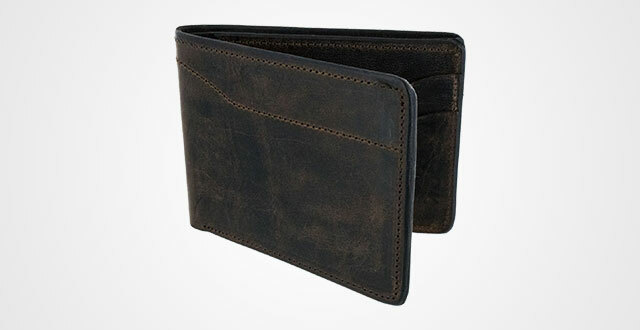 This mens long bifold wallet is a typical example. Made out of 100 percent goatskin stitched with heavy-duty Nylon, this piece not only comes in soft and comfortable texture, but also holds up well alongside with superb durability. 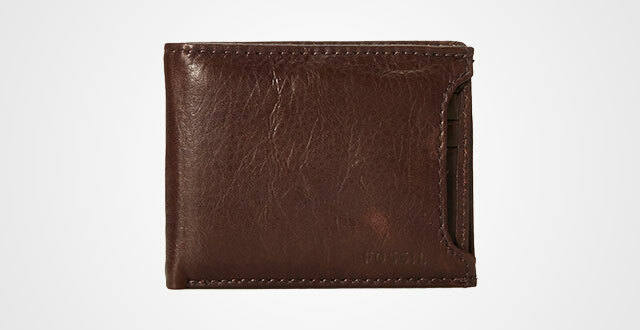 This USA-made wallet comes in simple outer performance to deliver a timeless and character look. It’s something rustic, vintage, mysterious and truly masculine. Besides, it is handmade by the finest artisans so just no doubts on its durability or sophistication. It’s built to last, guys! That’s also the reason why Hanks is very confident and proud of their products to offer such incredible warranty as well. However, in terms of capacity, I personally think it’s much smaller than others with just 4 card slots and 2 additional pockets. So, I highly recommend this piece for those who love carrying less or a minimalist person. For those who are looking for more affordable selections, this vintage long bifold wallet from Yeeasy will surely satisfy your need, especially if you’d prefer carry your whole world alongside as it comes in very spacious and streamline interior. Measured by 7.6 x 4.2 x 0.7 inches, there are 12 card slots, 3 full-length compartments and 1 ID window. That’s enough to hold up your whole life in the neatest way. I personally like the triple bill compartments as you not only enable to manage your currencies straightly, but also organize them such as one compartment for US dollars, one for the others, and one for receipts/bills/documents. Besides, made out of high-quality real leather, it comes in very durable, longevity, and wear-resistant to serve you for years. 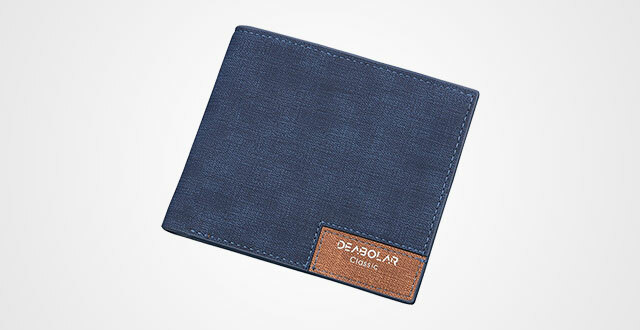 Manage a slim silhouette, you can put up this wallet in any space, such as pockets, bags, or backpacks. 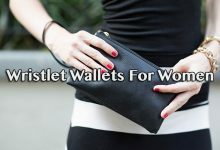 Though Yeeasy recommends this wallet for men, I personally thing women can try it, too if you are a character and strong individual. Come in rustic and nicely vintage look enclosed with a handmade leather woven rope, this bifold is one of the most favorite biker wallets nowadays. 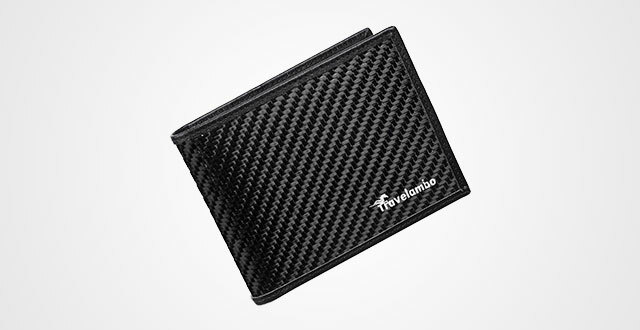 Though featured as a long bifold, it comes in roughly 7.1 inch x 3.5 inch x 1 inch, compact enough to fit in any pockets of a biker trousers whereas roomy enough to fit up your daily carry such as cards, cash, coins, smart phone and other stuff like that. The wallet includes 6 card slots, 2 full-length compartments and 1 zippered pocket. I personally like its handmade rope with hook so that you can easily connect this piece with your belt for more protection. Made out of premium cowhide leather, its outer performance is naturally aged look and something vintage. Not saying that its texture is quite soft, durable and comfortable to touch. In other words, you can’t go wrong with this. 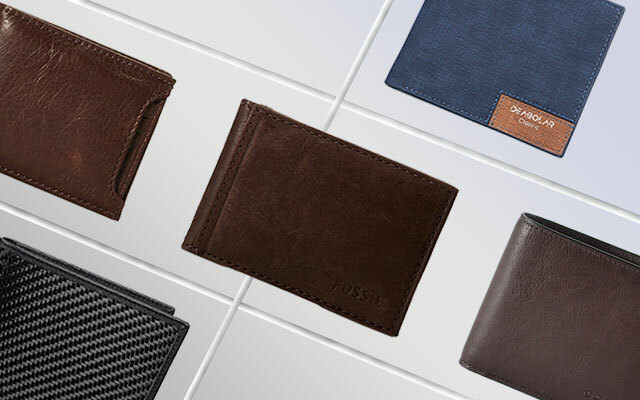 After having a quick view of these 12 products of the best bifold wallets for men, which is your pick of the bunch? Let us know in the comment section below and don’t forget to share us yours as we know there are still many great designs out there. Anyway, hope that through this article, you can grab the most suitable for yourself.